Reilser Kerweborscht Donation - bei Licht für Afrika e.V. 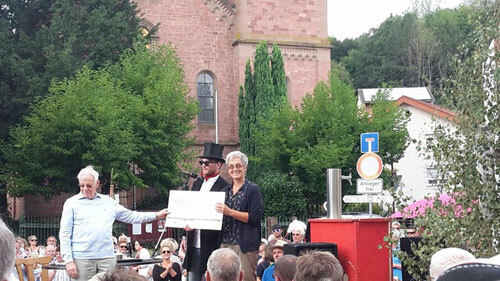 The „Reilser Kerweborscht“, invited June 18 all citizens for the yearly cultural event comprising comical as well as satirical artist performances, called „Reilser Dörndlfest“. After the „Kerweborscht“ in 2014 had had repaired the historical Reilsheim watch- and clock-tower with great commitment, there is the yearly „Reilser Dörndlfest“ in this local tower in the Schulstraße. The cheque handover ceremony was held during the parish fair on Sunday at the city hall.. This donation to the “Licht für Afrika e.V.“ association, which provides electricity by hydroelectric installations for remote villages in Tansania, will be able to procure further grid connections there. On behalf of all persons concerned we express our gratitude to the „Verein den Reilser Kerweborscht“ for their generous donation.